Q: The Dalai Lama is going to visit the Arunachal Pradesh in April. He will be meeting Indian government officials. Does China think this visit will damage China-India relations? A: China is gravely concerned about this. Our position on the eastern section of the Sino-Indian boundary is clear and consistent. The Dalai group has long been engaged in anti-China separatist activities and has put on dishonorable acts in the past on the boundary question. The Indian side knows very well the seriousness of the Dalai issue and the sensitiveness of the boundary question. Under such circumstances, India's invitation to the Dalai Lama to the disputed areas between China and India will bring severe damage to peace and stability of the border areas and China-India relations. 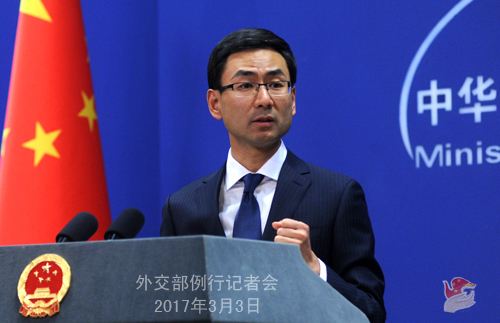 China is firmly opposed to the Dalai Lama's activities in the disputed areas between China and India and has expressed its concern to the Indian side for several times. 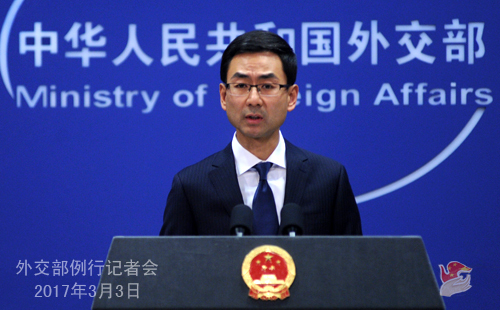 We urge again the Indian side to honor its commitments on the Tibet-related issues, follow the important agreement between the two sides on the boundary question, refrain from actions that would further complicate the question, not provide a stage for the anti-China separatist activities of the Dalai group, and ensure the sound and steady growth of China-India relationship. Q: This afternoon the China National Tourism Administration met with officials from the Embassy of the ROK in China to lodge representations over the incident of Chinese citizens being denied entry into the Jeju island. Is this related to THAAD? What is your comment? A: I don't know the specifics regarding the representations by the China National Tourism Administration to the ROK Embassy in China. On THAAD, China's firm opposition to the deployment of THAAD in the ROK by the US and the ROK is very clear and consistent and our resolve is firm. We have said repeatedly that China takes a positive and open attitude towards China-ROK exchanges and cooperation, but such exchanges and cooperation hinge on proper popular support and appropriate public opinion. I have to add that rather than making speculations out of thin air or filling oneself with suspicions, it is better to heed the voice of the people and take effective measures to avoid affecting China-ROK relations and bilateral exchanges and cooperation. Q: You just said that the Chinese side expressed concern to India on the visit of the Dalai Lama to the so-called Arunachal Pradesh. In what way did China express its concern? Was it a formal representation? Was it here in Beijing or in New Delhi? 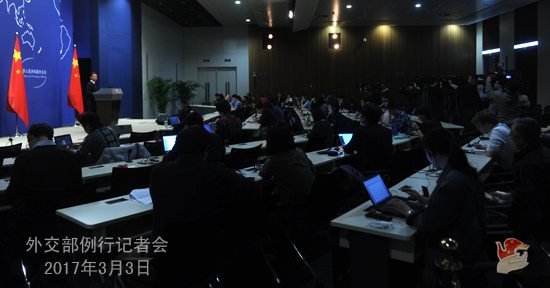 A: As I said just now, the Chinese side has expressed its concern to the Indian side on this. To my knowledge, this is a representation made through formal diplomatic channels. Q: ROK culture authorities and travel agencies say that China's tourism authorities have issued a ban on group trips to the ROK. Can you confirm that? A: I haven't heard of that. Just now I articulated China's position on THAAD again and will not repeat here. As I said, rather than making speculations out of thin air or filling oneself with suspicions, it is better to heed the voice of the people and take earnest steps to avoid further damage to China-ROK relations and bilateral exchanges and cooperation. Q: It is reported that recently a Hyundai car was smashed near a Lotte mall in China. There are worries that the "anti-THAAD campaign" in China is getting violent. What is China's comment? A: I want to point out that there isn't a so-called "anti-THAAD campaign" or "violent campaign" in China. As for the specific case you mentioned, the judicial organs will investigate and deal with the act if it breaches law. As I stressed just now, I hope relevant parties will listen to the voice of the people, take earnest measures and avoid more damage to China-ROK relations and bilateral exchanges and cooperation. Q: We have noted that from 1 March the ROK and the US have started their annual Key Resolve/Foal Eagle drills. It is reported that US strategic weapons such as the nuclear-powered aircraft carrier USS Carl Vinson, B-52 strategic bombers, B-1B Lancer bombers, B-2 stealth fighters and F-35B fighter jets will be included in the drills. The two sides will exercise on the concept of THAAD in battle for the first time. What is China's comment? A: The Chinese side has noted relevant report and has expressed China's great concern on this to relevant parties through diplomatic channels. Safeguarding peace and stability on the Korean Peninsula and Northeast Asia serves the common interest of relevant parties and is also their common responsibility. The current situation on the Peninsula is highly complex and delicate. Relevant parties need to make more earnest efforts that will help ease the situation and ensure peace and stability of the region, not the opposite. 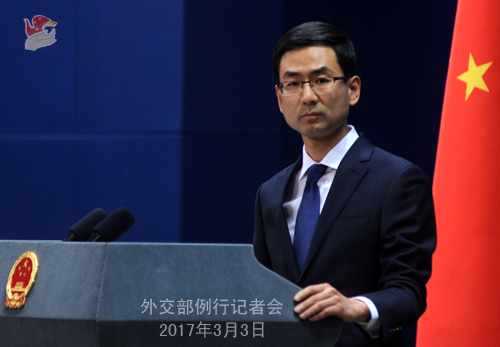 I want to emphasize again that China's position of opposing the deployment of THAAD in the ROK by the US and the ROK is firm and clear. We urge relevant parties to stop the deployment process and not to go further down that wrong path.